The mission of “World Kidney Day 2014”, celebrated globally on 13 March 2014, is to raise awareness on the importance of our kidneys to our overall health and to reduce the impact of the disease and its associated health problems. This year the launch will be at 1 Utama Shopping Centre on 16 March 2014 from 9am onwards. World Kidney Day (WKD) started in 2006 and has not stopped growing ever since. Every year, the campaign focuses on a theme. In its eighth year, recognition for WKD continues to grow, covering more than 100 countries in 6 continents and today, it has transformed into a global awareness campaign to attract members of the public to the importance of their kidneys. 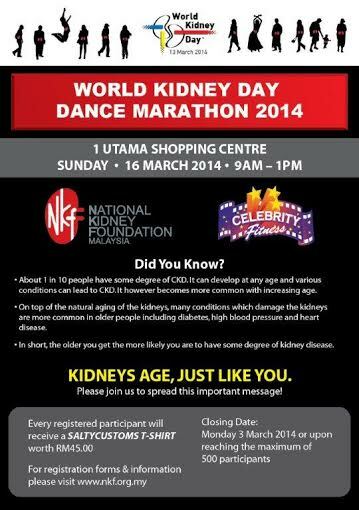 The WKD 2014 Campaign will focus on chronic kidney disease and aging. The theme for this year’s campaign is “Kidneys Age, Just Like You”. If detected early, Chronic Kidney Diseases can be treated, thereby reducing other complications and dramatically reduce the growing burden of deaths and disability from chronic renal and cardiovascular. Many people are currently not aware that their kidneys are damaged and they might find out too late. The need for dialysis or transplantation can be avoided if kidney diseases are detected early. The Marathon involves 500 participants led by dancers from the famous “Celebrity Fitness” gymnasium and together all will be dancing from 10.00 am – 1.00 pm in the concourse of the shopping centre. Registration fee for the event is RM30 per participant, who will receive a t-shirt worth RM45. Kindly please visit NKF’s website for registration forms and further information. Registration ends when 500 registrants have been reached or on Monday, 3 March 2014. 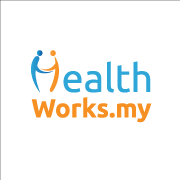 The National Kidney Foundation (NKF) Malaysia is a non-profit charitable organization dedicated to helping Malaysians suffering from end stage kidney failure who lack access to or cannot afford dialysis treatment. NKF currently has over 1,600 dialysis patients receiving subsidized dialysis treatment in our 28 dialysis centers nationwide.